Sam Sicard of First National Bank presents a $1 million check for Hunt's Park renovations. 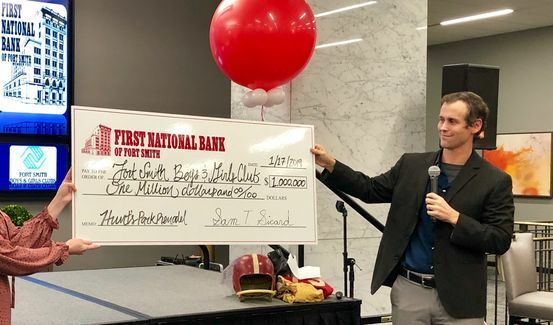 First National Bank of Fort Smith has donated $1 million to the campaign for the renovation of Fort Smith Boys and Girls Club’s Hunt’s Park athletic fields in Fort Smith. Jerry Glidewell, FSBG executive director, and Sam T. Sicard, First National Bank CEO, announced the donation and the renovation plans at a reception Thursday night (Jan. 17) at First National’s downtown office. Hunt’s Park, open in 1942, has been a vital part of youth athletics in Fort Smith for 72 years, Glidewell said. The facility, which includes both a football and baseball field, is in need of major renovations. First National’s donation will join others in a $2.5 million capital campaign for the park’s renovation. Renovation plans include replacing the in-field and north and east fences with black chain link; replace the current grass football and baseball fields with sports turf to eliminate the problems that come with inclement weather; replace the wooden bleachers at the football field with handicap accessible bleachers; replace the football press box; add a concession stand to the bathroom and remodel those facilities; remodel the baseball concession stand and press box; add a new roof over the batting cages; add in-play fabric screen, replace field lights with LED lights; and install security cameras and new signage, said Travis Beshears with Beshears Construction, a member of the FSBG board of directors. “This is a true gem for our city, and the renovations are going to bring in more people,” Beshears said. The fields are used for the FSBG football, flag football, soccer, cheer and baseball; community adult football; community adult and youth soccer; American Legion and Babe Ruth League baseball, including state and regional tournaments; Northside High School baseball’s program; and travel baseball tournaments. FSBG is talking with UAFS and Trinity Junior High and other private schools about possible other uses, Glidewell said. Hunt’s Park is located on Old Greenwood Road, near Creekmore Park, the Church League baseball fields, Girls Inc. and the Boy Scouts. “We want to show our commitment to the community, our partnership to the community. We had a record year, a very blessed year in 2018. We wanted to give back. We thought this was a great project. We think it will be used heavily. We need to show we are willing to reinvest in our community,” Sicard said, noting that after renovations, Hunt’s Park will be a premiere youth athletic facility. Though the park will remain Hunt’s Park, the football field will be named First National Bank Field in honor of the major donation, Glidewell said. Also, a Wall of Honor will be featured at the park, noting the prominent people attached to Hunt’s Field’s history, including politicians, including Gov. Asa Hutchinson, who coached at the fields, college and professional ballplayers and more. “Everyone has a great history at the park. It is the right project at the right time,” said Bill Hanna, president and CEO of Hanna Oil & Gas and FSBG board president. The renovation project will be completely privately funded. Fundraising so far has brought in $1.75 million, leaving $750,000 needed for the project, Sicard said. Surveys have begun on the fields. Renovations are expected to begin in May, after the Northside High School baseball season, and the project will be completed by the end of the year, he said.